According to many myths throughout the world, the origin and cause of infectious disease is a curse on humanity. Various disease deities, from the Greek Apollo to the Aztec source of disease Xipe Totec, have been attributed to causing and then frequently curing disease, particularly infectious disease. Prior to understanding the etiology of a given malady, people attributed illness to being a curse or punishment from the Gods or ancestral spirits. While most infectious diseases were extremely feared, and considered life threatening prior to the advent of modern medicine and antibiotics/chemotherapy, little was available to the healer as curative measures or preventative prophylaxis. Treatment options often included a combination of herbal medicines, rudimentary surgical procedures and magico-religious practices. Those desperate for cures and remedies often turned to healers who used magic and witchcraft in their healing preparations. The practice of magically curing or treating infectious diseases, particularly smallpox and plague throughout Europe and India, will provide the framework for my analysis of these interesting folk magical/medicinal practices. In addition, I will provide a brief overview of some lesser known disease deities and how the indigenous flora is used in their worship to better appreciate this neglected compendium of magical healing and esoteric botany. Jeremy Bechelli received his Ph.D. in infectious disease pathology from the University of Texas Medical Branch and his M.S. in microbiology from the University of Rochester. Jeremy is currently an Assistant Professor of Biology studying tick-borne infectious diseases and endothelial pathobiology. Jeremy is a long-time student of European folk magic and studies occult herbalism, folk medicine and the traditional witch-lore and practices of the British Isles. Jeremy also owns Phytognosis, a business focused on plant based spirituality, incense, resins, and botanical curious. Join forager and plant folklorist Rebecca Beyer for an exploration of the Medieval folk magical practices alive in the works of nun and mystic, Hildegard von Bingen. Composer, writer, and herbalist, this visionary woman carved a name for herself in the healing and the mystic arts around the year 1100 in what we know today as Germany. Though she would have shunned the title in her day, Hildegard was a magical practitioner in every sense of the word. She left many writings behind for us to use as a window to peer into the folk magical uses of plants in her day. Rebecca Beyer is a farmer, forager, herbalist, woodcarver, and witch from Asheville, NC. She holds a B.S. in Plant and Soil Science from the University of Vermont and has been learning and teaching in the Primitive Skills community for the last 6 years. She teaches foraging professionally as well as Ethnobotany at Appalachian State University where she is completing her Masters in Appalachian Studies. Her passions include botanical illustration, the folklore of Appalachian plants and writing her blog: Blood and Spicebush. She is currently stewarding land at the Hawk & Hawthorne, a community of magical people growing food and teaching classes on foraging and esoteric arts in Western North Carolina. Lecture: Sickle and Sheaf: on plants, metals and their interaction in history, folklore and magic. During this presentation, Cody will be discussing the curious, sympathetic and often antagonistic relationship between various plants, metals, and spirit intercessors, with a particular focus on the often maligned ore that is iron. Throughout history, and among the majority of the peoples of the world, cultural and ethical taboos have developed around the act of meeting living plant matter with various metals. These accounts vary remarkably, and it can be difficult to seize upon a common thread beyond the fact that selecting appropriate metals to work with particular vegetal material has been a deep consideration for a very long time. We look toward these folkloric and historical accounts, that we better attempt to understand what occurs on a numinous level when the two very different realms collide in an act as seemingly simple as the pruning of a rosebush, or the act of gathering herbs dedicated to higher sorcerous endeavors. Also to be considered are the roles played by various spirits and shades possessed by these metals and plants and the places in which they are indigenous and/or cultivated. It is hoped that during the course of the presentation, we may begin to form some manner of deeper understanding of the forces at work when sickle meets sheaf. Cody Dickerson is a writer and student of the Germanic mysteries, British cunning-folk magic, and is an initiated Braucher, or Powwow practitioner. A blacksmith by trade and a gardener by avocation, he also studies the rural folk magic and traditions of North America, Europe and Mexico. Some of his research work in these areas has recently been published with Three Hands Press. His work as a blacksmith remains primarily in the realm of commissioned ritual art and implements. He currently resides in the western US, and has been working intimately with trees and plants for many years. His experience with iron and metalwork developed parallel with his plant work and they have often cross pollinated, bearing strange and wonderful fruit. While the concept of a World Tree is common in many cosmologies, the Afro-Diasporic traditions of the New World have complex extant rituals and devotion revolving around the Tree, embodied within Cuban Lucumí, Haitian Vodou, and Brazilian Candomble including offerings, songs, myths, dance and possession by this spirit. It is a spirit so unifying that all spirits can gather under it, and the tree itself is not just ‘home’ to a great spirit of time, space, protection and petition- it is the spirit itself. The tree is so imbued with ashé (grace/power) that every growing member of its species is the deity itself. This deity, called by many names, but here examined as Iroko, Loko, and Kitembo, is the product of African reverence and its mapping upon the sacred landscape of the Americas. In the absence of the original West African Teak, the World Tree becomes the Silk Cotton, the Ceiba, the Mapou; it becomes the Banyan, the Strangler Fig, the Figueira. Here the deity spreads new roots deep into the melding soils of our Land, strong and needed as he ever was. This lecture will provide a rooted examination of Iroko and his unique manifestations in the persona, rituals, songs, myths, and dances of Lucumí and Candomble Orisha traditions, with references to its expressions in Haitian Vodou, Candomble Angola, and Quimbanda. Jesse Hathaway Diaz is a folklorist, diviner, artist and performer living in New York City. With initiations in several forms of witchcraft from both Europe and the Americas, he is also a lifelong student of Mexican Curanderismo, an initiated olosha in the Lucumí orisha tradition, and a Tatá Quimbanda. He is also a member of the experimental theatre group Dzieci, based in New York City. He is half of www.wolf-and-goat.com, a store specializing in occult art, esoterica and materia magica from many traditions including Traditional Craft and Quimbanda. Dr. Anderson will present a framework for understanding certain aspects of parasitism that are rarely touched upon outside of esoteric philosophy and practice, especially from the Eastern prospective. As part of this lecture, the audience will be given a framework for understanding parasitism and energetic level which encompasses concepts such as ghostly possession, Harmful magic projected by others, and inherited burden as it is encountered within some streams of Taoist thought. Once this framework has been established, Dr. Anderson will then present means to address several of these categories of “infestation” through the use of herbal medicine which here includes: plant and mineral matter as well as some forms of metal. John Anderson is a practitioner and teacher of several styles of Asian medicine having received his Master’s degree in Oriental Medicine at the Florida College of Integrative Medicine (FCIM) and his Doctorate in Acupuncture and Oriental Medicine at the Oregon College of Oriental Medicine (OCOM). Dr Anderson’s formal training extends to the use of herbal medicine from the perspective of Chinese medicine, both classical (ShangHan method) and contemporary (through the Ding/Shen/Hammer lineage). In addition to his formal education in Chinese Medicine, he has had training in Lakota practices and in Eastern esoteric herbal medicine and Chinese folk medicines. As part of his broader learning process, he has worked with plants, stones, and other natural ingredients for the better part of 20 years, beginning with many aspects of contemporary European paganism. This interest evolved and grew to encompass Eastern philosophies and practices. His ongoing research interests include: Gu syndromes, virtue medicine in tradition of Wang Fengyi, Daoist and Buddhist exorcistic practices, and Disability Studies at large. Dr. Anderson currently teaches at South Baylo University (SBU) in Virginia where he teaches all aspects of Traditional Chinese Medicine (TCM) to graduate students including diagnosis, acupuncture, and herbal medicine. In past years, he has also taught in Florida at the Florida College of Integrative Medicine (FCIM). He currently resides in Washington, DC. In this lecture I will discuss some of the ways plants have been used by shamans for soul healing in different cultures from around the world. I will also discuss some of the plants I use for invoking and cleansing, calling back and sending forth, a soul, or soul part. Most of the plants I use in my work grow in this northwest bioregion and I hand harvest them for medicine. I also keep a wild and wondrous, mystical garden. And it is always remarkable when a plant just shows up. In shamanic cultures the world over, all life is thought to be permeated by spirit. It is believed that every life form is animated with its own essential energy, or soul. The entity of the soul is boundless, invisible and unexplainable, but as real as any physical entity. The soul is a quintessential part of who we are, and requisite if we are to become who we were made to be. The entity of the soul suffers and endures many trials and hardships in a life’s journey. Souls get lost, they get stolen, they get manipulated and they get sick. So do we. Souls get confused and lazy and broken. When our essential soul force is weak and low, so are we. This is when we are most vulnerable to illness. Shamans throughout the world have always seen illness as a spiritual disharmony, and illness was placed in one of two categories, Loss of power & Loss of soul. In this lecture I will also share case histories from decades of practice, and some of the healings the plants have called forth. The soul is our vital essence, and the plants are essential to our vital self. Joyce is a plant healer and gardener who lives and works at Fire Rose Farm where she teaches classes and apprenticeships and keeps a potent garden filled with beauty, mystery and medicine. She has maintained a private practice for decades, keeps a magical apothecary, loves flower essences and is an inspired and dedicated medicine maker. Joyce has completed two twelve year apprenticeships with Guadalupe Gonzales Rios, a Huichol Shaman and elder and has devoted her life’s work to the Plants and the Shaman’s Path of the Heart. The Pyrenean territory was scenario to the consolidation of the important role of Poisons and Intoxication in relation to Witchcraft, shaped and encapsulated under the now forgotten concept of Metzineria, a term that bears an enormous historical burden containing a valuable amount of hidden -and often deviant- wisdom. While observing the ways in which the path of Metzineria developed through time and space, other mysteries unfold; such as the importance of the process of Intoxication as a key for interacting with the Unseen, hiding behind the arcana of the Flying Ointment. 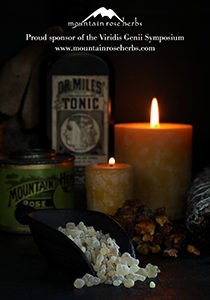 Through an analysis of the implications and evolution of herbal knowledge in the context of Metzineria and Poison making, it is possible to see the true face of the Witch Toxin and its current relevance in the Crooked Path of Traditional Witchcraft. Known as Semproniana Tort, she is a researcher and one of the founding members of the Gremi de l’Art (The Art’s Guild), an initiative whose goal is to spread the magical traditions and lore of the Iberian peninsula through academic insight and both individual and collective practice, in order to give cohesion and support among the practitioners of the Arte, always bearing in mind not only the existing Old Craft but also its new resulting forms. She is also owner of Occvlta, an endeavour focused on the recovery and diffusion of the path of Metzinera, or Pyrenean folk medicine and magic, crafting high quality herbal products and artifacts for the alchemist, the poisoner, the apothecary, and the witch. She now resides in the Catalan Pyrenees and her practice revolves around the awakening and remembrance of forgotten witch and plant lore. How do we know what we know about the healing properties of plants? How can we glimpse the Arcanum, the innermost healing nature and essence, of a plant? Hermeticism positions the Five Elements as central forces of creation. All that exists is composed of these principles, and if we learn to understand their essence, we hold the keys to the Kingdoms of the Nature. In this lecture we will journey from classical and renaissance references to modern day use of elemental assignations in practical herbology and alchemy/ Spagyrics. Karin Di Giacomo has studied the Plant Kingdom, Alchemy, Astrology, Gnosis and Hermeticism for more than 50 years. Part of the Founding Group of the Philosophers of Nature she was involved in disseminating and promoting knowledge of Spagyrics in North America. Her translation of a book on Standardization Methodology in the preparation of Spagyric Essences has added to this process. Her main focus in working with the Plant kingdom is the comprehensive Paracelsian approach, with emphasis on ‘Reading the Book of Nature” directly and understanding not only the healing properties but the true Arcanum of the Plant Being. Her work with Trees spans five decades and found expression in the Druid Project and many workshops in the USA and Europe introducing gnostic awareness and spiritual science approaches in compiling a new Pharmacopeia of trees. Her background includes Master’s Degrees in Economics and Psychology and she is a state licensed German Heilpraktiker (Naturopath). Studying Gnosis, Mysticism and Magic, i.e. Hermeticism, she also has been involved in creating powerful Hermetic Seals and Talismans, some of which will be for sale at the Viridis Genii Symposium. 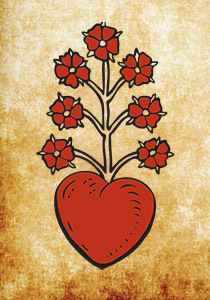 Apotropaic derives from the Greek word apotrepein meaning “to ward off”. Apotropaic magic is a subfield of magical practice focused on the study of protection and warding against evil, maleficent substances, the evil eye, and disease. In this hands-on workshop, you will learn some of the most popular historic and folk magical practices regarding apotropaic plant charms and how to integrate them into your current practice. Examples of handmade charms will be presented and explained before participants learn to construct their own protective plant charm. All materials will be provided. Join folk forager and herbalist Becky Beyer for an exploration of the medieval folk magical practices alive in the works of visionary nun and mystic, Hildegard von Bingen. Composer, writer, herbalist and preacher, this visionary woman carved a name for herself in herbal healing and mystic arts around the year 1100 in what we know as Germany today. By formulating a few of her medieval remedies, we’ll sample and examine where folk magic and herbalism met 1000 years ago. Though she would have shunned the name at the time, Hildegard was a magical practitioner in every sense of the word and left many writings behind for us to follow in her leather clad footsteps to discover the world of early medieval folk magic in Germany. In this workshop, we endeavor to explore the deeply intimate, beautiful and often hostile relationship that exists between the plant world and that of metals. Historically, there are a multitude of fascinating encounters between plants and metals, particularly when mankind stands in as intercessor, and here we hope to intimately experience firsthand an occasion where this interaction bears an enchanting fruit. During the workshop, participants will have an opportunity to work with several different metals, preparing small, personal effigies of varying function and form. These will then be placed at the mercy of various plants and their attendant spirits by bathing them in carefully prepared, plant-based solutions. These devotional ablutions will elicit dubious reactions from the metals, simultaneously appealing to the eye and exhibiting the cunning and prowess of the virid kingdom — ultimately imbuing the metals with a presence only attained by direct interface of plants and metals. Our interest here goes beyond either elemental or aesthetic appeal, however. Religious, magical and popular traditional elements of plant lore related to the those we will be working with will be discussed. Additionally, we will examine the lore of various entities and beings associated not only with plants, trees and metals, but those places where human feet seldom tread; for it has often been said that in these places, the most supreme acts of sorcerous transformation occur. This workshop will continue the focus on the songs, dances, offerings, and prayers to Iroko on a more practical level. Because Iroko. the orisha of time, space, protection and petition is embodied in certain trees, he can be approached by anyone that knows how and treats him with respect. Providing basic food offerings prepared communally and teaching songs of honor and respect to the King of Trees, this workshop will provide further information on this orisha and its service. The focus of this workshop is on the energy of the runes of the Elder Futhark system, and correlations in the plant kingdom and herbalism. 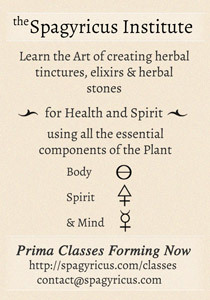 This system uses the basis of Janine’s studies in Western Herbology, human physiology, Flower Essences, the Wu Xin path of Traditional Chinese Medicine, European folk traditions, German language and of course, the Futhark itself to solidify and contextualize the elusive idea of ‘Healing Runes’. Janine Tyto Hagal is an invasive wildflower with a long taproot in NJ. When not studying folk magic and crafting herbal medicine, she might be found in a transcendental state. It’s just best to leave her be in that case. She really enjoys reading, rune-casting, and cooking elaborate vegan meals. She’s an Aries with a Pisces moon, and Leo rising, but is surprisingly bad with writing autobiographical content (lol). Janine is sole proprietor and purveyor of Black Earth Botanica, a traveling botanica that seeks to merge the truth in folklore, with medical herbalism. She makes tinctures, jewelry, oils and more, all inspired by global healing techniques. In this hands on workshop we will have a discussion about soul, and deepen our awareness and reverence for this complex and essential landscape and visage of self. I will share healing approaches to steady and soothe, strengthen and cleanse, revitalize, inspire, and protect the soul. Each of us will practice. We will use plants, gesture, smoke, holy water, and invocation to ignite healing. We will then create ritual together to inspirit and empower this healing deep within our blood and bones, deep within our invisible, powerful, exalted self. We will finish up by crafting a personal elixir to take with us to incite and embolden the healing we have called forth, and to help us remember and feed all that was created in medicine light of this circle. Taking as reference the flying ointment as the culmination of the Witch Poison, we will take a look at the famous recipe of the Ungüento Populeon that has appeared in old herbal texts since the Middle Ages, an ointment that incorporates some of the so-called witches plants that have been related to poison making ever since. We will analyze its components, the process for making it in the context of witchcraft, and the effects it has on the body and the spirit. A student of plants since he was a child, Marcus R. McCoy holds a degree in Transpersonal Anthropology with a focus on the ethnobotany of magical plants. He is the progenitor of Bioregional Animism, and has published his works on the subject of plant teacher shamanry in Reality Sandwich. Marcus has also been published in Verdant Gnosis Volume 1, and is one of three editors of the book series. Marcus studied south american vegetalismo for many years, which is where he started his focus on perfumerismo. He is a professional perfumer and proprietor of House of Orpheus and alchemical practitioner, studying with Robert Bartlett. Marcus is also a student blacksmith with special interest focusing on the occult art of herbal quenches working within the context of alchemical philosophy and folk magic. His smithy is called Troll Cunning Forge, and he produces custom made occult iron work for the occult community. Marcus is also a teacher of folk magic and has ongoing classes on the Botany of the Dead as well as the folk lore of the magical projectile. He lives in the forests of the Olympic Mountain range in Washington with his lovely partner in the cunning crafts, Catamara Rosarium.